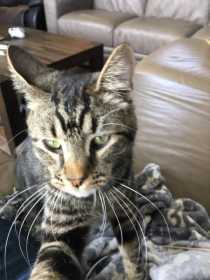 Our brown and black tabby has gone missing. He responds to George or Georgie. He has a brown tipped tale, medium hair, chubby belly, and is about 10 months old. He is microchipped. Has a collar but it's a breakaway so he may not have it. He's a very friendly and affectionate cat.